Hair extensions are innovative and fashionable items that readily add length and volume to your natural hair, turning the shortest hair locks into luxurious, lush tresses. However, choosing the right one can be a bit of struggle since there are so many options to choose from, and so many factors to take into account. Plus, there is also a huge price difference between the different types of hair extensions, which is why you need to have an idea of quality, purpose, and cost. 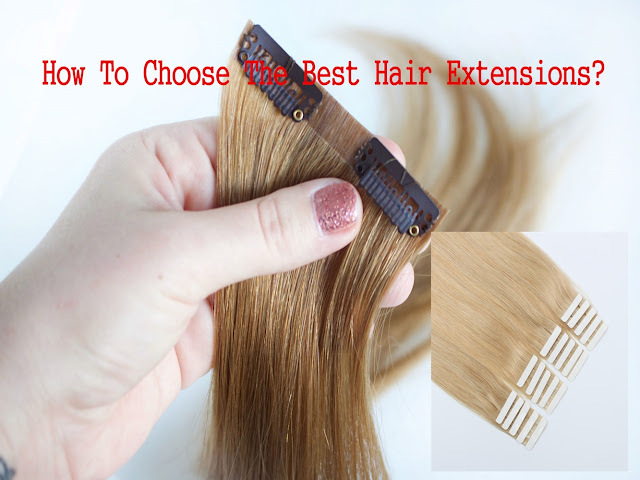 In order to get a better understanding of how to pick the right hair extensions for your particular hair type, refer to the guide below. Human hair extensions are the first choice of expert stylists, since the extensions have to be more natural looking and can be both styled and colored to meet the client’s preference. A more costly option than synthetic extensions, human hair extensions provide greater flexibility and require more care. This hair can be styled with a blow-dryer, hot roller, ceramic straightener or curling iron, and styling products can also be used. Gentle washing and conditioning are required, and with proper treatment, these extensions can last for over a year. On the other hand, synthetic hair extension tend to be the first choice for a lot of women, because they are long-lasting, affordable and require low maintenance. They are made from plastic fibers in either curly or straight style and need little maintenance to retain the look, which will not be impacted by rain or humidity. The style is baked into the synthetic fiber, which usually offers a less natural-looking texture, feel and look as compared to human hair. Plus, synthetic hair can become matted if slept in or washed, and it can’t be dyed, so color matching is extremely important when buying extensions. A majority of synthetic hair products can’t be heat-styled with blow dryers or curling irons without destroying or melting the hair, but new technologies are being introduced that can bear heat to a certain degree. Synthetic clip-ins are easy to apply and fall at the low end of the pricing scale, whereas a full mane of human hair professionally affixed in the hair salon is a pretty expensive and lengthy process. In order to decide the right option for you, you need to take into account the length, style, application method and budget constraints. There are so many brands and styles of hair extensions to choose from that it can get a little overwhelming, especially if you are shopping for the first time. Both online and offline stores offer hair extensions, but you may feel a little hesitant picking stuff online. If you are buying hair extensions for the first time, have no one to help you out, and are planning to use them for a big event, then it is best if you stick with an in-store purchase. This is because buying a hair extension is not as simple as it sounds. You will need to get a good color match, find the perfect length, and play around with a few hairstyles and hair types before you are finally able to decide the perfect fit for you. Online hair extension shopping will not allow you the freedom to try on various hair extensions before you finally find the right one, but with a walk-in store, you will be able to properly see what suits you best and seek the help of the staff if you feel confused or indecisive. Hair extensions are available in a surprisingly wide variety of retailers once you start to look for them. They are sometimes easily passed by otherwise. Even dollar stores and other discount stores carry them, and some women do use them successfully for everyday use. Beauty supply stores, fine department stores, wig salons, online sites, and hairdressers are some other options for buying hair extensions. Getting the right color hair extensions is a key part of the entire process of achieving a beautifully natural look. Various salons and companies use various color measurements on their extensions, which can get confusing. The tip top, which is the part of the extension that will be visible on your own hair when attached, is the most important match. Identify the color of your hair from the tip to the middle of the strand. Blending your hair on the bottom part is crucial for a natural, real-hair look. The newly grown hair at the root will not make for a good match and the hair will not gel well with your own natural hair. If you are purchasing your extensions at an outlet or salon locally, you can color-test by holding the extensions up to your hair in natural light to assess how close the match actually is. Go with the shade that is the most evident in your original hair. If your hair is a mixture of different shades, it is best to first consult a stylist about the perfect extension color for your hair or seek the assistance of the staff prior to buying the hair extensions. Hair is measured in grams, and it is important for you to know how many grams are present in your hair extension set. The right hair extensions are ones that have the proper length and quantity of the strands. Using 20 inch or longer hair extensions is not recommended if you are buying for the first time and have zero experience with handling hair extensions. Besides, the longer the strands, the more expensive it will be and it will require more time to blend with your natural hair. Typically, you will need 125 – 150 strands if your natural hair is of normal thickness. If you have super thick hair, then consider going for 150 – 180. Short hair usually requires less than 150 strands. If you are aiming for volume rather than length, then 75 strands will be enough. Clip-in hair extensions comprise of several hair strands, each attached individually. Typically, 3” to 4” wide pieces are applied on the back of your head in multiple layers, and a few 1” to 2” wide pieces are fixed on the sides. As is suggested by the name, every strand is attached to your natural hair with a clip. With a little practice, clipping in the extensions becomes quite easy and takes only a couple of minutes. Taking clip-in extensions off is even easier. Tape-in hair extensions comprise of one-inch broad pre-taped hair wefts and thin taped wefts that basically tape in between your natural hair in sandwich-type bonds. At present day, they are the most requested type of hair extension method simply because they stay secure and discreet, appearing like your own natural hair. This method is 100% natural requires no chemicals or tools and can last up to three months since the hair is reusable. However, a lot of people prefer clip-in hair extensions over tape-in since they find the former to be more convenient, easy to use, and versatile.